Small Simple Earrings - 3 Ways. 1/4" Quilling Paper. The exact amounts used are provided under each design. Quilling form or object that is 2" in diameter. 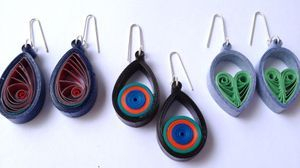 Make 2 tight closed coils using your quilling tool and the 3" strips of color A. Begin the inner circle shapes with a 17" strip of color B. When the end is reached, glue to secure. Seamlessly join a 17" strip of color C and then color D. Make 2. 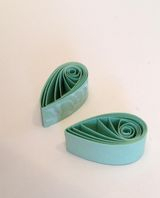 Shape your two coil rings into teardrop shapes being careful to place the paper seam at the bottom of the earring. Place a strip of glue on the inside of the outer teardrop as shown below. Insert the small circle into the teardrop and push against the glued surface to secure. Be sure to hide the paper seam from view. Line a strip of glue along the top point of the earring and secure one of the small tight closed coils. Repeat with the second earring and you are finished. Once your earrings are made, you will want to seal them for protection and then connect the jewelry hardware. Information on both of these steps can be found near the bottom of this tutorial. 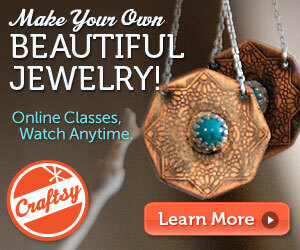 Using the 2" tier of your quilling form and 34" of color A, create a closed coil ring. Make 2. 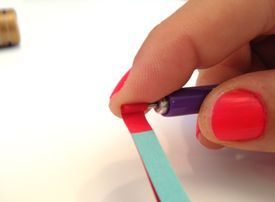 Using your slotted quilling tool and both of the 3" strips of color A, make 2 tight closed coils. Glue a 10" strip of color C about 1 inch below the top of a 10" B strip to create a double strip. Before rolling, place a line of glue around the inside of one of the rings you made in the previous step. Roll your double strip inward toward the C strip. Carefully remove the double coil from the tool and place inside the glued ring. Allow to expand. Using your fingers, gently swish the coil around, ensuring all sides make contact with the glue. Allow the glue to dry and then create a teardrop shape. Take care that the seam is placed at the base. Repeat these steps to make a second teardrop. Place a strip of glue along the tip of each shape and attach the small closed coils that you made earlier. Try to hide the seams near the point so they do not show. 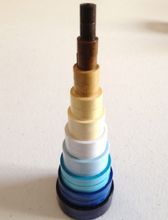 Using the 2" tier of your quilling form and 34" of color A, create a closed coil ring. Make 2. Turn the rings into teardrop shapes. Take care to place the outer paper seam at the point. Using your quilling tool and the 3" strips of color A, make 2 tight closed coils. Using your quilling tool and the 4.25" strips of color B, create 4 open coils. Glue to secure and shape into teardrops. Place the paper edge at the point. Notice which way the paper fans. Face two teardrops towards each other with the paper pointing inward as shown below on the right. Smear a bit of glue on the one side and press the two shapes together to create a heart. Place glue on the outer edges of the hearts near the points and place them into the narrow part of the teardrops. 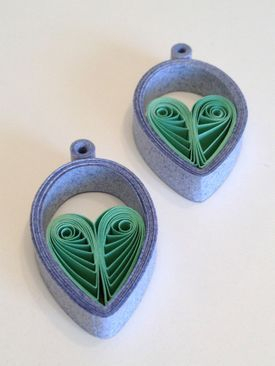 Place a strip of glue on the outer earring directly above the center of the heart. Secure a small closed coil on each earring. When the glue has dried, you will want to seal them for protection. There are many methods and products available. I choose to seal mine by hand using a UV protected nail enamel. Using your jewelry pliers, stretch open the O-rings and curve in the corners before attaching. Doing this will allow for an easier and more secure entrance.